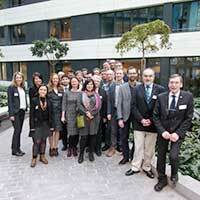 On 18th/19th January, the kick-off meeting of the CO2EXIDE project “CO2-based electrosynthesis of ethylene oxide”, coordinated by Fraunhofer IGB, Straubing branch BioCat, was held in Brussels to give the initial starting point for partners to work. “Every partner, from academia to industry, knows about the significance and impact of the CO2EXIDE project on the further development of future chemical factories”, Dr. Tobias Gärtner introduced to the audience. In the course of the meeting, the workplan and project internal cooperation have been discussed intensively – partners from different areas of science had the chance to get in touch with each other. 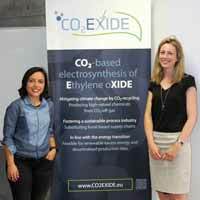 The CO2EXIDE project aims at the development of a combined electrochemical-chemical technology for the production of ethylene oxide from bio-based CO2. Initially, the electrochemical step pursues the simultaneous conversion of CO2 to ethylene at the cathode and water oxidation to hydrogen peroxide at the anode. A subsequent chemical conversion of both intermediates to ethylene oxide will deliver e.g. oligo-/polyethylene glycol in a chemical cascade reaction. The CO2EXIDE technology combines a modular nature for the feasibility of a decentralised application, a high energy and material efficiency / yield and the substitution of fossil-based production of ethylene oxide. In line with the energy turnaround, the CO2EXIDE technology will be combinable with renewable energies and allows for the direct creation of products, which can be integrated into the existing supply chain. The reactions will be operated at low temperatures and pressures and forecast significant improvements in energy and resource efficiency combined with an enormous reduction of GHG emissions. All improvements will be quantitated using life cycle assessment.